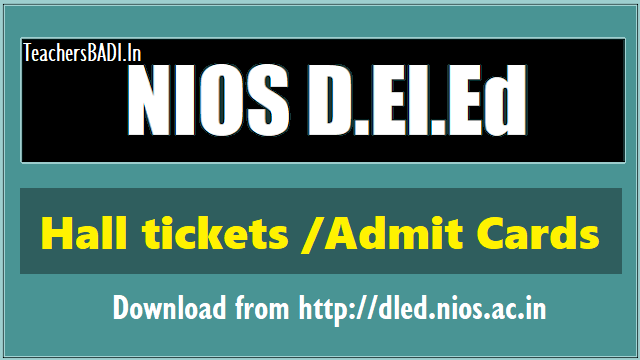 NIOS D.El.Ed Hall tickets /Admit Cards /Intimation Card 2018 download from dled.nios.ac.in: NIOS Hall Ticket/Intimation card for D.El.Ed Exam. NIOS D.El.Ed. Admit Card: NIOS DELEd Admit Card 2018 Download now on dled.nios.ac.in: National Institute of Open Schooling, NIOS has released the NIOS D.El.Ed. Admit Card 2018. NIOS DELEd Hall ticket or Intimation card for Diploma in Elementary Education, D.El.Ed 2017-2019 programme is now available for download. Direct links and steps to download the NIOS DELEd Admit Card 2018 have been given below. The DELEd Admit Card 2018 has been released by NIOS and is now available for download on the official website dled.nios.ac.in. NIOS D.El.ED Admit Card 2019 released for 4th exam at dled.nios.ac.in, exam on March 15. The National Institute of Open Schooling (NIOS) has released the hall ticket for fourth exams that will be held on March 15, 2019. The admit cards can be downloaded from its official website dled.nios.ac.in. The NIOS fourth exams will be held for papers 508, 509 and 510. Step 3: Key in your enrolment number and date of birth and submit. Step 4: Your NIOS Deled admit card will appear on the screen. Step 5: Download and take its print out. On the day of exam, candidates should carry one valid photo id proof issued by the government with their hall ticket to enter into the exam hall. NIOS releases Hall Tickets for D.El.Ed. exam: National Institute of Open Schooling (NIOS) has released hall ticket for the Diploma in Elementary Education (D.El.Ed.) exam. The NIOS D.El.Ed exam will be conducted on December 20 and 21, 2018. Candidates need to enter their enrollment number and date of birth for downloading the admit card. The NIOS, through the examination award certificates of successfully completion of the teacher training, which is being conducted every year for the untrained in-service teachers. As per the amendment in the RTE Act 2009, all the un-trained in-service elementary teachers have to successfully complete the D.El.Ed. programme by March 2019. A large number of un-trained in-service elementary teachers have enrolled and pursuing the D.El.Ed. programme through NIOS. The NIOS is conducting this training programme since October 2017. The training session concludes in March every year. December Exams: NIOS DElED 2018 Admit Card for third exam released at dled.nios.ac.in. National Institute of Open Schooling (NIOS) has released the admit card for third Diploma in elementary education (DelED) exam. Candidates can download the admit card from the official site of NIOS at dled.nios.ac.in. The examination will be conducted on December 20 & 21, 2018 across the country. The examination will be conducted from 2pm to 5pm. Understanding Children in inclusive context exam will be conducted on December 20, 2018 and Community & Elementary education paper will be conducted on December 21, 2018. The examinatio for third D.El.ED examination is for untrained in-service teachers under the DelED programme under Ministry of HRD. Candidates who will apply for the examination can download the admit card through the official site of NIOS. Enter the enrolment number and date of birth to get your respective admit card and click on submit. Keep a hard copy for further need. Candidates need to carry the identity card sent by the NIOS and admit card in the examination hall. The second semester result was out on first week of December and around 12 lakh candidates have appeared for the semester exams conducted from September 25 to 29, 2018. For more information, candidates can take a look at the official site available. Candidates are advised to download the NIOS Deled Admit Card 2018 at the earliest as details such as the examination centre address and date and timing of the exams would be printed on it. Steps on where and how to download the NIOS DElEd Admit Card 2018 have been given below. a. Download Hall Ticket from Official website dled.nios.ac.in only. c. Apart from the I card and the Hall ticket, candidates should carry one valid Photo ID Proof issued by the Government to enter into the Examination Hall. Step 2: Scroll down to the link saying Hall Ticket/Intimation card for D.El.Ed Exam. Step 3: Click on it or alternatively, find the direct link embedded here for your convenience. Step 4: A new portal would open. Enter your Enrolment number and Date of birth. Hit Submit. Step 5: The hall ticket would be made available on screen for download. Take out two hard copies of it and keep it safe for future reference. September Exams:The National School of Open Schooling has released the Hall Ticket or Admit Card of 2nd Examination for untrained in-service teachers under Diploma in Elementary Education (D.El.Ed.) programme. The examination will be held on September 25, 26, 27, 28 and 29 between 2.30pm and 5.30pm. Here is the direct link to download the admit card for NIOS DElED September exam 2018. NIOS DElEd Admit Card Download for September 2018 Exam on dled.nios.ac.in : National Institute of Open Schooling, NIOS is expected to release the NIOS DElEd Admit Card 2018 for the second examination scheduled from September 25 soon. As per the information and reports available, the NIOS Dled Admit Card has been released for the September Examinations. However, there is no official notification yet on the website dled.nios.ac.in. Candidates who have registered for the September exams of NIOS Dled 2018 can check their admit card on the direct link provided below. Please be notified that we have not been able to confirm whether or not admit card is released. Candidates are hence advised to check. Also, only the official link to the website is provided. Candidates are strongly advised to check only on the official website. Steps to download NIOS Dled Admit Card: Go to the official website of dled.nios.ac.in and go to the NIOS Dled Attendance Login/ Exam Centre page. Direct link to admit card login id is provided here. On the new window that opens, enter the enrolment number and date of birth. Search for the link to download admit card and click on it. Candidates are again advised to note that the admit card notification has been released on the official website as yet. However, reports are suggesting that the NIOS DElEd Admit Cards for September 2018 examination were released on September 18. Any confirmation or update regards the dled admit card would be provided here. NIOS: National Institute of Open Schooling, NIOS is an autonomous institution under Ministry of HRD, Government of India. Diploma in Elementary Education, D.El.Ed programme is a specifically designed course for in-service untrained teachers working in primary/ higher primary schools in the different states of the country. The programme has been designed by the Academic Department, NIOS on the initiative of Ministry of Human Resource Development. The programme has the aim of enabling the untrained in-service teachers to instil skills, competencies and understanding in them to make teaching and learning more effective.